Summary: Here is an announcement by Chuck Spinney of a new book of interest to anyone who desires to better understand American’s defense apparatus — the largest investment ever made by our government. 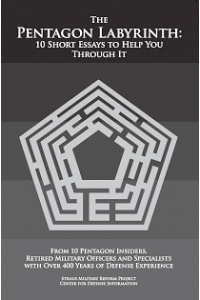 It is my pleasure to announce the publication of The Pentagon Labyrinth: 10 Short Essays to Help You Through It. This is a short pamphlet of less than 150 pages and is available at no cost in E-Book PDF format, as well as in hard copy from links on this page as well as here and here. Download the whole book in PDF format, or use the links below to read individual essays and supplemental materials. Included in the menu below are download links for a wide variety of supplemental/supporting information (much previously unavailable on the web) describing how notions of combat effectiveness relate to the basic building blocks of people, ideas, and hardware/technology; the nature of strategy; and the dysfunctional character of the Pentagon’s decision making procedures and the supporting role of its accounting shambles. reform the failed defense procurement system without changing a single law. The handbook ends with lists of contacts, readings and Web sites carefully selected to facilitate further understanding of the above, and more. Essay #1: Why is this Handbook Necessary? “Genghis John.” Proceedings of the U. S. Naval Institute. July 1997, pp. 42-47. Statement before the Subcommittee on National Security, Veterans Affairs and International Relations, Committee on Government Reform, US House or Representatives. June 4, 2002. The New QDR: The Pentagon Goes Intellectually AWOL. CounterPunch. February 2010. The JSF: One More Card in the House. Proceedings of the Naval Institute. August 2000. Defense Death Spiral, September 1998. Porkbarrels & Budgeteers: What Went Wrong with the Defense Review. September, 1997. Defense Time Bomb; Background: F-22/JSF Case Study Hypothetical Escape Option. March 1996. Three Reasons Why the ATF Should Not Be Approved for Engineering and Manufacturing Development. July 23, 1991. Defense Power Games. October 1990. Essay #4: Congressional Oversight. Willing and Able or Willing to Enable? “Nothing’s too good for our boys!” — Why Can’t DOD give us Quality and Quantity? Previous Post The Raymond Davis incident shows that we’re often ignorant because we rely on the US news media. There is a solution.